All TROPIC ISLE 4TH SECTION I homes currently listed for sale in Delray Beach as of 04/21/2019 are shown below. You can change the search criteria at any time by pressing the 'Change Search' button below. "137 FEET OF DIRECT INTRACOASTAL WATER FRONTAGE!!! 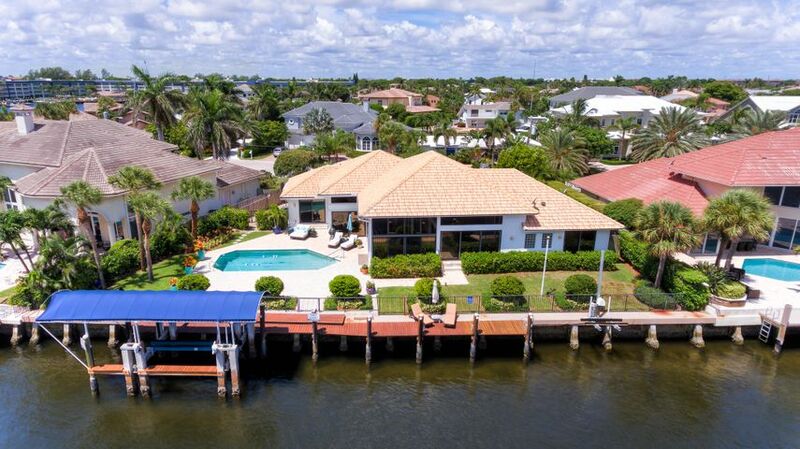 Enjoy stunning views from every room in this 4 bedroom 3 bath pool home with 137 ft of direct waterfront along the intracoastal waterway. Located on one of the few oversized lots in Tropic Isles the property is lushly landscaped with a large travertine patio, heated pool and a private dock with jet ski lift and covered canopy boat house. The high ceilings, open layout and stunning views make this home perfect for entertaining. Features include... recently renovated bathrooms and gourmet kitchen with top of the line Sub-Zero & Jenn Air appliances and granite counters, hurricane impact windows and doors, large his and hers walk-in closets in the master with custom build outs, oversized laundry room & home generator. This home is a boaters"